GTC Gymnastics Birthday Parties – Rochester Hills – GTC Gymnastics hosts customized birthday party options at their huge facility in Rochester Hills MI. GTC Gymnastics birthday parties come in 90 minute or two-hour increments. GTC parties are packed with games, jumping, and physical fun! Kids will climb, jump, race and bounce at a GTC birthday party! GTC Rochester Hills offers 3 birthday party packages – the Somersault Package, the Cartwheel Package, and the Ultimate Back Handspring Package. All GTC birthday parties include set-up, gym time, party room time, a surprise birthday gift for the birthday boy or girl, birthday ribbons for the guests, and more. GTC will even cleanup the room when the party is finished. Prices for packages are based on the length of the party and the number of party guests attending. GTC Gymnastics Rochester Hils has tons of add-ons to make the party even more special. You can choose additional decorations, and balloon boquets, food and drink packages and goody bags, or even add an inflatable bounce house! 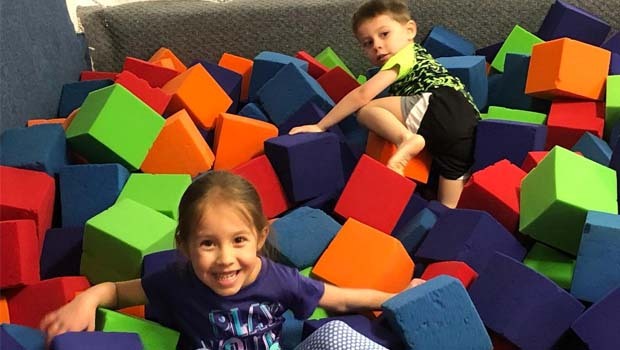 GTC Rochester Hills birthday parties aren’t just gymnastics… Kids can enjoy high flying Tarzan Swings where they soar over and jump into a huge foam pit. Sky Dives take place where kids can leap into the foam pits from giant stack of mats. GTC has the kids take place in Blue Mountain Races where kids race in pairs down a carpted runway and up a huge mat hill to slide down to the other side. Gymnastic Training Center staff will sing a Birthday Song Serenade to the birthday child. Using a multi colored parachute, friends take hold of the sides and the birthday child sits in the middle and is turned around on the parachute while everyone sings Happy Birthday. The birthday child is the center of attention throughout the birthday party at GTC Gymnastics birthday parties. Parents will enjoy a stress free party since the staff takes care of all the hassles. Decorations (provided by customer), serving and clean-up are done by Gymnastic Training Center. There are three different birthday party packages available at Gymnastic Training Center. Host can bring in cake and ice cream if they choose. Pizza and beverages may be added on to any birthday party package.